A very good product, works brilliantly and very pleases with the service from this company. Would definately use again. We purchased this scanner last year to scan multiple documents into our Radioloy Information System. The scanner performs extremely well and has been very reliable which is what we require in a busy radiology department . I found the knowledge of the product from Tradscanners to been excellent and not a hard sell. I actually wanted another scanner but was given unbiased information from Tradscanners which allowed me to make an informed choice and it has fulfilled my needs. I am very happy with the scanner and I would rate it 4 out of 5. It meets our needs perfectly and the reproduction quality is excellent. I would recommend the scanner and your company to others. Very happy with product, easy to use fast and efficient, better than we expected. Take a moment to think about those multiple-step scanning operations that are done again and again, day after day. Scanning, editing, naming, choosing a file format - it's so repetitive. Now imagine the time and money you could save by doing all that at the press of a button. That's what Kodak's Smart Touch functionality is all about. 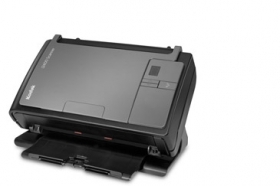 The KODAK i2400 Scanner with built-in Smart Touch functionality lets you capture, manage, process, and deliver PDFs and other file formats - automating processes that previously were time-consuming.